causing, inducing, compelling or forcing a student, whether by way of a practical joke or otherwise, to do any act which detracts from human dignity or violates his/her person or exposes him/her to ridicule, or compels him/her to for bear from doing any lawful act, by intimidating, wrongfully restraining,wrongfully confining or injuring him/her or by using criminal force to him/her,or by holding out to him/her any threat of such intimidation, wrong full restraint, wrongful confinement, injury or the use of criminal force. Ragging being an evil practice,is inhuman, illegal and punishable. It violates the discipline of an educational institution and adversely affects the standards of higher education. Ragging in educational institution is banned by the Honorable Supreme Court of India. The Court has issued mandatory orders to curb the menace of ragging in educational institutions. If an applicant for admission is found to have indulged in ragging in the past or it is noticed later that he/she has indulged in ragging, his/her admission may be refused or he/she shall be expelled from the educational institution. The punishment may also be in other forms, such as suspension from the classes for a limited period, or fine with a public apology, debarring from representation in events, withholding results,suspension or expulsion from hostel or mess, and the like. If the Head of the Institution is not satisfied with these arrangements for action, an First Information Report (FIR) can be filed without exception by the institutional authorities with the local police. The discretionary power vests solely with the University Authorities. We at Honorable RGNUL are committed removing ragging in all forms. 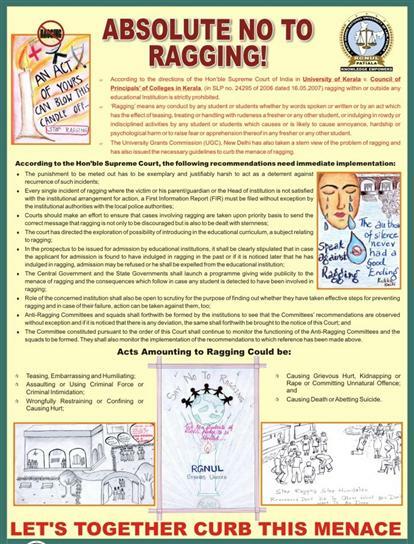 In compliance with the guidelines laid down by the Apex Court of the country RGNUL has constituted an Anti-Ragging Committee. Anti-Ragging Committee comprises of four Faculty Members nominated by the Registrar. The Committee shall assist too be serve the recommendations/directions issued by the Honorable Court without exception and if it is observed that there is any deviation, the committee shall inform the Registrar of the University. "Let's together curb this menace."